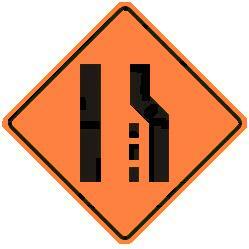 30-inch W4-2 Orange Lane Reduction or Drop-off symbol. (Standard Reflective on .080 gauge aluminum). Direction is determined by the lane that is ending, or dropping off. For example, the sign with a straight line on the left is considered Right because the Right lane drops off.